Let’s toast to spring! Spring brings new bright green buds and flowers, but another sign of spring that you may not notice is the busy moving season. Look around and you will see more and more moving trucks on the road. If you are one of the lucky folks on the move, you are probably up to your knees in boxes and packing paper. You’re trying to figure out how to pack everything so it ends up in one piece in your new home. Well, let us help you with one of the most difficult items to pack: wine glasses. Because of their odd shape they are often packed incorrectly and their delicate glass and long stems get broken in the moving process. 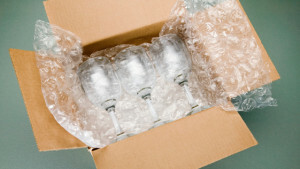 Select the Proper Box: One of the key factors to keeping your wine glasses from breaking or getting crushed is using the proper box. You need a box that is big enough and secure enough for your glasses. We recommend a “dishpack” box because it’s 5.2 cubic feet high and has double thick walls for extra protection. Wrap: Place a wine glass on packing paper horizontally. Grab a corner of the packing paper and roll the glass into the paper. Make sure to tuck the sides of the paper in, like you would do wrapping a burrito. Continue rolling the glass on the paper until you reach the end of the paper. Place the now wrapped glass back on another piece of packing paper horizontally and roll again. Repeat 3-5 times (depending on thickness of glass) with more sheets of packing paper until the glass is properly secured & cushioned. Continue for each wine glass. Label the outside of your “burrito” package: “glass” so it won’t get tossed out with the extra packing paper. 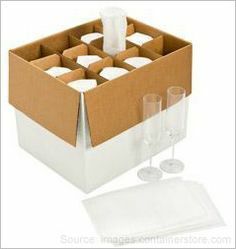 Pack & Pad: Before placing any of the wrapped wine glasses in the box, cushion the bottom of box with packing paper. If you are using the cardboard inserts, position one layer of the inserts in the box on top of the packing paper and place one wrapped glass into each cardboard insert. If you are not using the cardboard inserts, place the wrapped glasses vertically in one layer in the box. Make sure to place them standing up and not lying flat. They are more secure vertically. Layer & Repeat: After completing the first layer, place packing paper on top. Add more inserts or place wrapped glasses vertically. Repeat these layers until the box is full. Stuff Empty Space: Once the box is full, fill any remaining space with crumpled packing paper. The layer of crumpled paper will add extra cushion and security for the glasses. 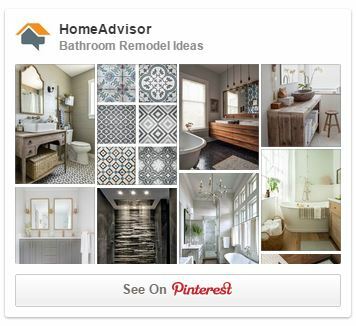 Now you can look forward to that Bordeaux on the other end of your move. May your new home be full of many occasions to raise your glass! Cheers! Laura McHolm is an organizational, moving & storage expert and co-founder of NorthStar Moving Company. NorthStar Moving Company is an award winning, “A+” rated company, which specializes in providing eco-luxury moving and storage services.